Manufacturer of a wide range of products which include automated ultrasonic cleaning machine. Automated Ultrasonic Cleaning Machine makes use of an automated mechanism in order to clean the surface. The cleaning solution contains ingredients designed to make ultrasonic cleaning more effective. Most hard, non-absorbent materials (metals, plastics, etc.) not chemically attacked by the cleaning fluid are suitable for ultrasonic cleaning. Ideal materials for ultrasonic cleaning include small electronic parts, cables, rods, wires and detailed items, as well as objects made of glass, plastic, aluminium or ceramic. 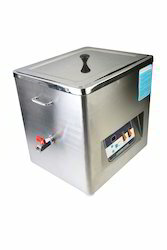 Looking for Automated Ultrasonic Cleaning Machine ?